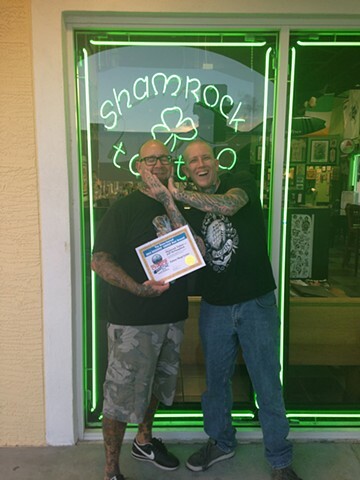 Welcome to Shamrock tattoo, a fully custom tattoo studio serving the Daytona Beach area since 2007. We feature Central Florida's best tattoo artists, skilled in a broad variety of styles: from American traditional, portraits, Japanese, and tiny tattoos to full bodysuits. We can take your ideas and transform them into a spectacular custom tattoo designed to last. Our studio space is clean, comfortable, and inviting. With a rotating schedule of guest artists there is always fresh new art to admire. Of course, we adhere to the strictest standards of safety and sterile procedures, making sure your experience is both fun and safe. So please call or stop in the shop for appointments or consultations.